If we are what we eat, then, as Christopher D. Cook contends in this powerful look at the food industry, we are not in good shape. The facts speak for themselves: more than 75 million Americans suffered from food poisoning last year, and 5,000 of them died; 67 percent of American males are overweight, obesity is the second leading cause of preventable death in the United States and supersizing is just the tip of the iceberg: the way we make and eat food today is putting our environment and the very future of food at risk. 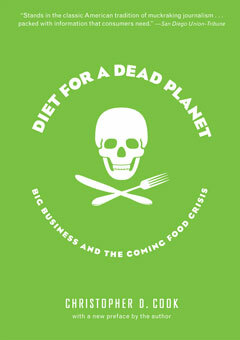 Diet for a Dead Planet takes us beyond Fast Food Nation to show how our entire food system is in crisis. Corporate control of farms and supermarkets, unsustainable drives to increase agribusiness productivity and profits, misplaced subsidies for exports, and anemic regulation have all combined to produce a grim harvest. Food, our most basic necessity, has become a force behind a staggering array of social, economic, and environmental epidemics.